Kids are super curious about a lot of things! 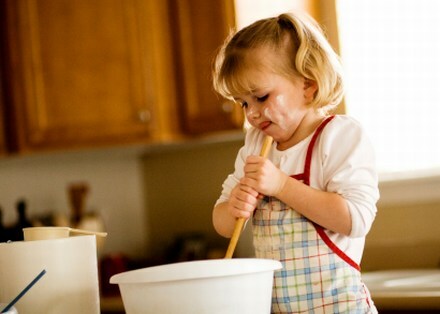 The sights and sounds and smells of food preparation make the kitchen the most fascinating room in the entire house for young children. 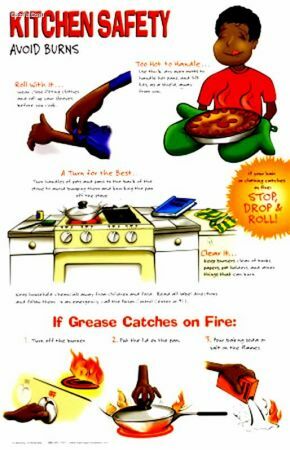 A child who can reach the top of range also may be able to spill a pan of boiling water or scalding-hot grease over his body. Below counter-top level, hazards often include toxic household chemicals and hot water pipes under the sink, cabinet drawers full of knives and an oven hot enough to broil meats. Cover or conceal any electric outlets below counter-top level. Dont allow electric cords to hang below the counter or table top. Do not store sharp instruments, such as knives or dangerous chemicals where small children can reach them. Never allow the handles of pots or pans to extend over the edge of a kitchen range; keep them turned toward the rear or the side of the stove. When you buy a kitchen range, make sure the heating units and controls are beyond the reach of small children. 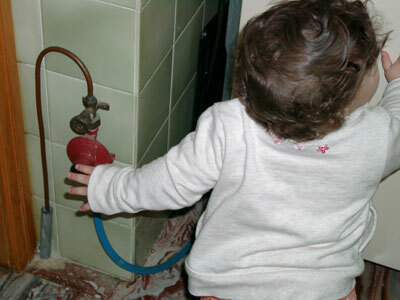 Keep children away from kitchen areas that may be especially hazardous during meal preparation; a child playing on the floor beside a kitchen range is much more likely to be burned by hot liquids that are spilled. When pouring hot liquids, always pour away from you and slowly. Instant coffee and soup mixes tend to effervesce when boiling water is poured too quickly. Choose coffee cups or mugs that are designed so the will not tip easily. Some modern stemmed cups are attractive, but they tend to be top heavy, so they are more likely to tip over. When you set containers of hot foods or hot liquids o a table, put them as close to the center of the table as possible or at least, well away from the edge. When small children are likely to be around, use place mats instead of a table cloth that can be pulled off, along with containers of hot foods. Never use lighted candles on the table when children are present. 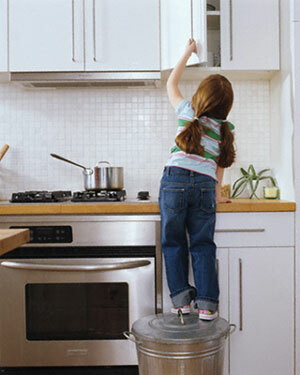 Help accident-proof your kitchen by adopting the perspective of a small child. 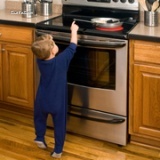 Remember that a child may not be tall enough to see that a plt on the stove or a bowl on the table contains hot food. If a child is allowed to play with pots and pans, he may think of the food containers on the kitchen range as his toys. If he sips fluids occasionally from an adults cup, he may assume that the cup on the table is for his use. Resist the temptation to hold a child in your arms while you drink any hot beverage. A frisky child can knock the cup out of your hand in a fraction of a second. Put the youngster in his playpen, high-chair, or some other safe place during your coffee break. 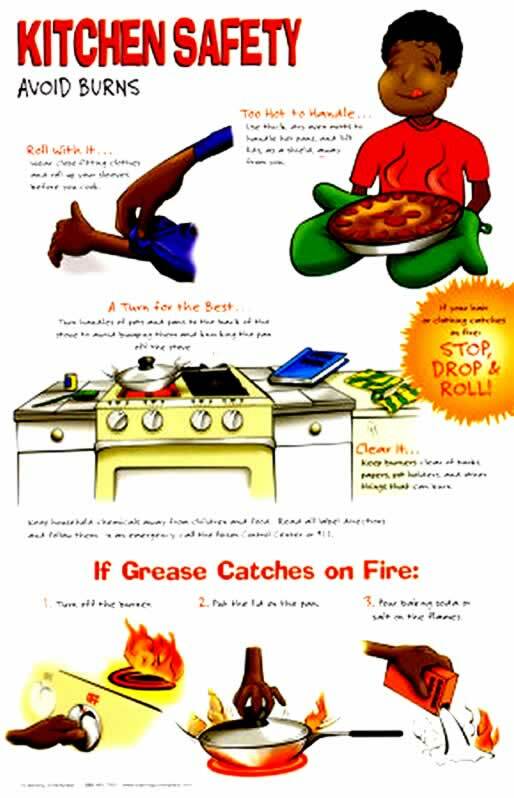 Finally, be sure you know what to do if an accident occurs in the kitchen despite all precautions. For example, in case of burns apply ice or cold water to the burn area. Keep your doctors telephone number posted nearby so you can contact him quickly about any serious accidents. Most accidents are predictable and predictable and preventable. Make yourself a committee of one to keep the kitchen a happy room rather than a hazardous room.